The new chief of the Philippines' anti-drug agency has promised a fresh approach to the controversial war on drugs, "based on the rule of law". Aaron Aquino said that since he took over in August, only one suspect had been killed in 1,341 operations. Thousands have died in the anti-drug campaign since it was launched by President Rodrigo Duterte in 2016. Rights groups say Mr Duterte has sanctioned extrajudicial killings by vigilantes and by police. Mr Duterte and the Philippine National Police (PNP) claim there have been no unlawful extrajudicial killings by officers under the current government, and say any suspects killed by officers were resisting arrest. But when asked by the BBC why he thought the PNP had been removed from leading anti-drugs operations, Mr Aquino said: "The PNP were removed from this war on drugs precisely because there are some issues against them. "There are issues on some abuses, the so-called extrajudicial killings." According to police figures, 3,967 people were killed in the force's anti-drug campaign between June 2016 and 25 October this year. Rights groups estimate that thousands more have been killed by vigilante gunmen, and accuse the police of supporting the vigilantes. The latest decision by the president followed a series of controversial killings over the summer, including that of 17-year-old Kian Delos Santos. The death of the student during a police anti-drug operation in August sparked protests outside the President's palace. Mr Aquino said his agents would wear body cameras to film their operations, to prove they are abiding by the law. "We want our operations to be transparent," he said. "I told [agents] to ask the media to join in on the operations so they will see everything from the very start of the operations to the end." The PDEA say they have arrested more than 400 people over the past month and seized around $1m (£754,400) worth of illegal drugs. Despite the criticism levelled at the police, Mr Aquino said he would continue to seek the assistance of the PNP during "high level" operations. He said he wished that the drug war would eventually handed back to the police, because of budget and staffing constraints affecting his agency. The PDEA has around 2,000 officers compared with the country's 165,000-strong police force. This month, President Duterte indicated that he would consider reappointing the PNP to lead the war on drugs if there were no improvements on drug addiction levels in the Philippines within six months. He said: "If things get worse again, I will say to these apes: 'Go back to this job. You solve this problem of ours.'" Mr Aquino said that the president had personally said nothing to him before announcing his agency would take the lead on the drug war. He found out from the news. 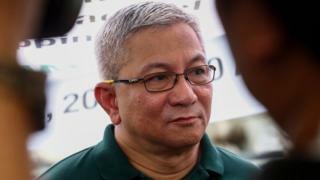 "I just saw the president telling me, or telling the public that from now on… that he will let the PDEA be the sole agency in charge of the war on drugs," he said. A former Philippine National Police (PNP) Regional Commander, Mr Aquino was appointed as Mr Duterte's new anti-drugs czar in August, just two weeks before he was due to retire. The two had worked closely for more than 20 years while Mr Duterte was the mayor of the southern Philippine city, Davao. Video Philippine drug war: Profiting from death?